Trekked up to Everett, Washington last weekend to do a lighting workshop for the Fire and Rain Glass Bead Society. After a long drive it was great to pull in and see so many smiling faces. We had a great location and set up multiple lighting scenarios with different backgrounds and even though I showed them how I do it, I also shared some simple things they could do to make their photos better. First, we went over basic digital capture and histograms, then moved on to f/stops, light quality and reflectors. We then broke into smaller groups and shot work they had brought and they thought it was cool to see how much punch you can get out of one light. It is amazing to see how finely detailed and small a lot of the beads are. It was a lot of fun to present to such an enthusiastic audience. I’ll be doing another glass lighting workshop this summer in the Portland area in case you missed this one! This entry was posted in Advertising, Commercial and tagged art, artworks, fire & rain, glass beads, glass photography, lighting workshops, photography workshops on May 12, 2009 by admin. Arguably one of my favorite fine-art photography clients is Rick Moore and his cool and quirky fantasy creatures. His latest one, “Octohands” was created in 2006 and he recently completed the patina and brought it by the studio for his portfolio. Weighing in at a little over 90 pounds, it’s 3/4 life size and was a little daunting to move alone. I had several clients over for portraits while this was set up (love having the space for multiple shoot set-ups!) and it was fun to see them do double-takes, once they saw what it was! 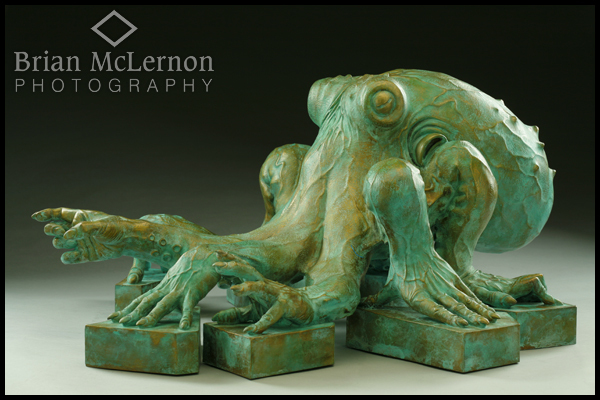 This entry was posted in Commercial and tagged art, artworks, hands, octopus, Rick Moore, sculpture on February 5, 2009 by admin.